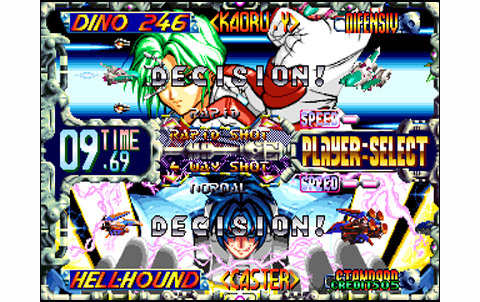 Ladies and gentlemen, here is the review of the most acclaimed Shoot them Up in the Neo Geo history. Starting with the awesome intro of the game that sets the tone: we're granted a splendid cartoon involving the vessels and characters of the game. 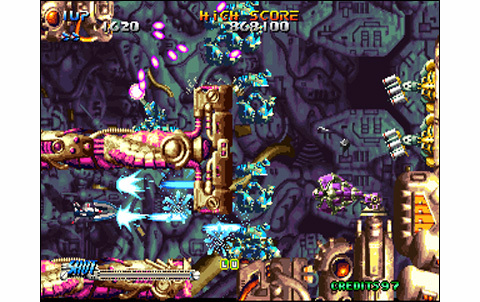 This out-standard game released in 1998, is the emblem of pixel-art and 2D experts mastery. 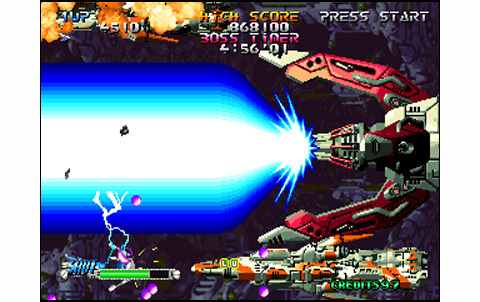 Indeed, two-dimensional Shoot them Up are no longer en vogue in these late nineties. This genre is now mostly made of 3D, or at least based on 3d backgrounds. 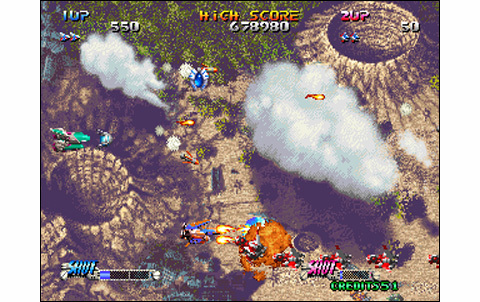 Moreover the success of manic shooters has relegated more traditional shooting games to the status of relics. 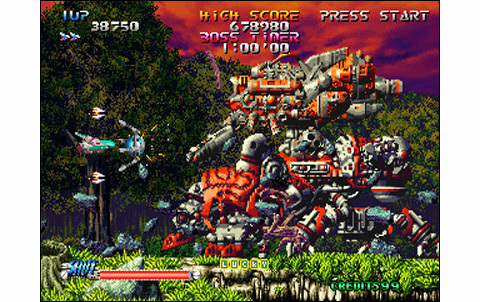 Genres go, but pure hits stand as pure hit through the test of time: this is the case with Blazing Star. We start by setting the difficulty level. Seven are proposed, no less! From “easiest” for newbies to “Godly” for the most furious! You can also choose between the six different spaceships proposed, each having its own strengths and weaknesses. The “Hellhound” is for example a perfect ship for scoring and performing combos, the “Windina” has a wide and powerful shot, which is nice if you're a beginner; both “Dinos” - the Pulstar hunters -are excellent in defense and pack efficient weapons; finally “Aryutalism” and “Peplos” require a little more skill and are for more experienced players. 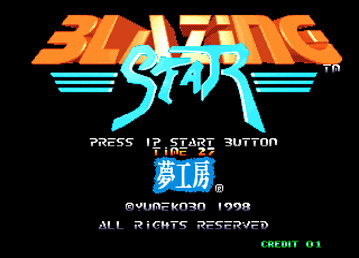 Speaking about design, Blazing Star design is simply breathtaking for a 1990 system. Even today, one is still surprised by the sharpness of graphics. The colors are gorgeous, the scrollings are sometimes very fast, sometimes slow, made of great fluidity. 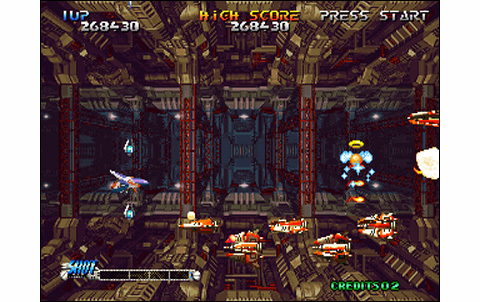 The second stage background, for example, scrolls a pre-computed 3D scene, and the result is incredibly successful. This same effect is used again a few stages later, this time with in-depth displacement... very impressive, so much you should prepare your vomitive baggy! 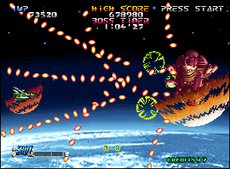 Really, the tri-dimensional effects used in the various stages and for enemies animation are remarkable. Backgrounds are diverse, going from a desert to a dense forest, from inside a star-based space station to the Earth's atmosphere. The sprites are beautiful, numerous and well animated. 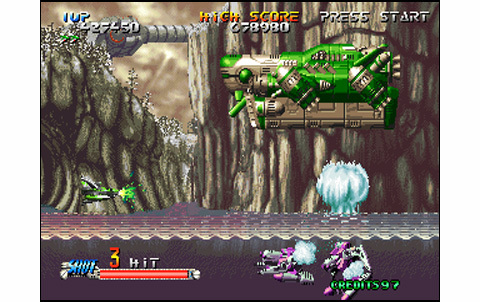 Creatures and ships change depending on the area, and even if some of them are found from one stage to another, each level has its own sprites. 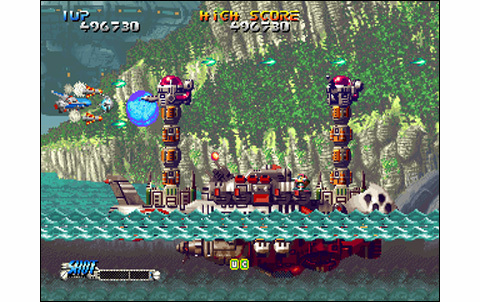 There are few slowdowns, even when dozens of sprites are displayed on screen. Anyways, these are generally welcome, as the action is intense and hard to follow! Sound effects and music support the action beautifully, especially the voice commenting on your performance. 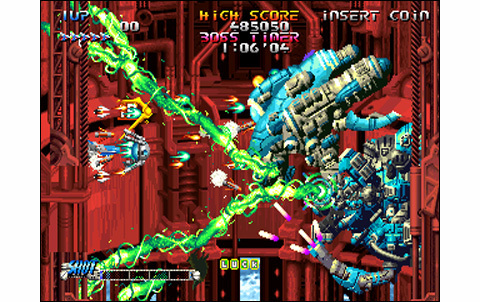 Gameplay, in addition of being greatly enjoyable, features some significant subtleties. A combo system makes you score more or less points by using multiplying factors. 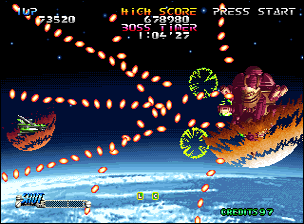 Shooting down a maximum of enemies with the same blast generates up to a 128x multiplying factor, hence the interest of B button, which disperses the main fire... giving way to new strategies! There's also the “Event Items”, i.e. balls of different colors that are also score multipliers. In each stage, don’t forget to collect the five “LUCKY” letters for a substantial bonus in the end. 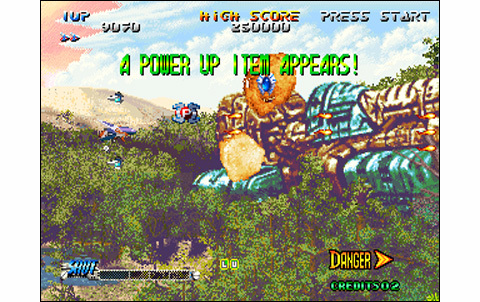 After you have cleared a stage, you'll be graded on your scoring performance, number of lives used, enemies killed, and bonuses collected. The cooperative play is the opportunity to share some good time. 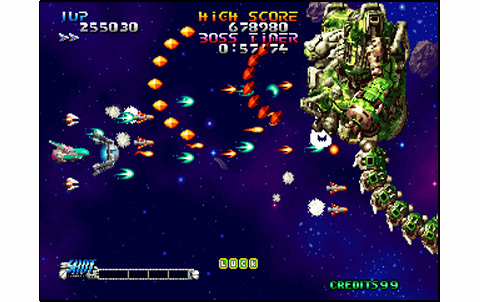 If the infinite continues allows to finish the game straight away, it seems worthwhile to go for a limited-credits challenge or just aim for the highest possible scores. 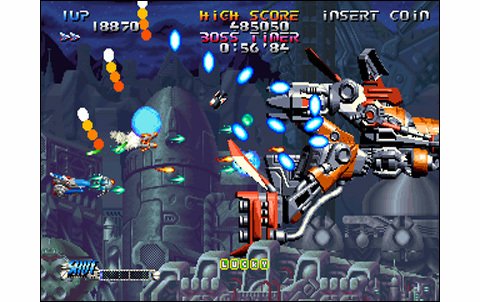 The combo system is very well thought out, and the controls obey sharply. Even though the game ends quickly with infinite credits, one will come back often for the pleasure. 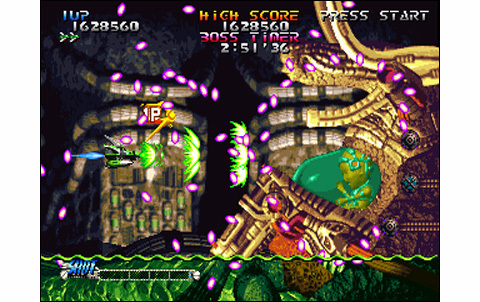 A skilled player can meet the challenge with a spaceship more difficult to handle, like, for example the Peplos, which is particularly hard to master. 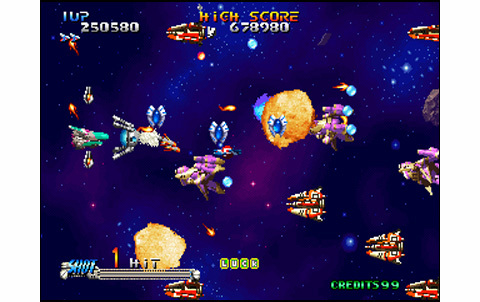 Each of the different spaceships must be played in a different way and asks for a specific strategy and approach. This is one good reason for playing another game of Blazing Star! The vessels are beautiful and diverse, the animation is gorgeous, Bosses are huge and move in a supernatural way; there's zooms, deformations, rotations... Wow, this game really takes your breath away! Its sumptuous design and particularly pleasing gameplay will have you coming back regularly, like the pilgrim on the St Jacques de Compostela road. Amen... No! BONUUUUUSSSS! The system is pushed to the limit. Backgrounds are wonderfully drawn and the spaceships are superb, it's great art. 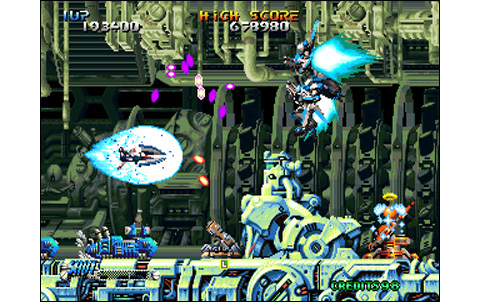 Smooth, decomposed, fast... it's almost perfect, if not for some rare slowdowns when playing cooperative. Very close to perfection! Musical themes are catchy and sound effects are blowing! BONUS! 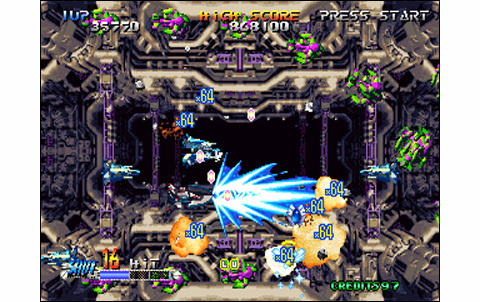 It's good, with the scoring system, the six spaceships and the 2-players mode. 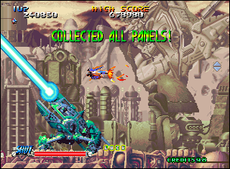 With infinite credits, the game ends too quickly: try a one-credit-clear! 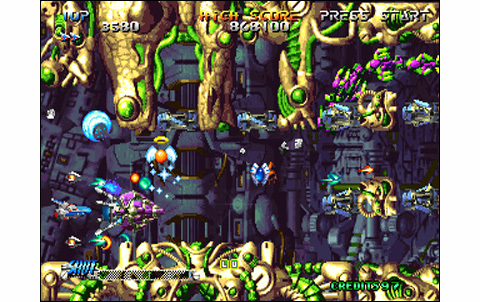 Flawless: controls are smooth, gameplay is addictive and dynamic, while difficulty is perfectly increasing in advanced stages. 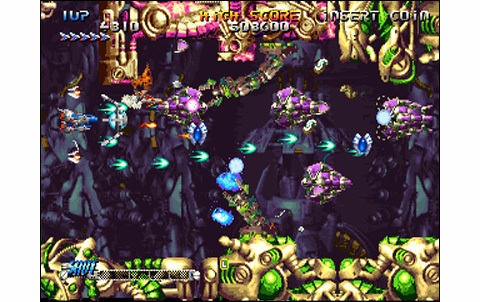 With its spaceships diversity, Blazing Star offer many ways of play. Simply the best shoot them up on the system, period! 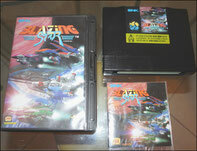 Blazing Star is japanese only release on the AES, and it is extremely high priced. You'll have to give more than 1K euros to get a copy. Better go for the MVS or a convert of it, which for somewhere around 200 bucks, will offer a good value/money rate.